Here at GoShindig, we love to share ideas with you so that we can all enjoy the art of outdoor entertaining. It’s what we enjoy spending our time doing the most, but there are times when we need to take a step back and concentrate on ourselves. Hammock chairs are one of my favorite ways of doing this. Allotting myself an hour or two to put my feet up on the patio and engross myself in a book whilst disengaging my brain from the outside world is an invaluable tool to have at my disposal. I’m not entirely sure why hammock chairs are so much better at achieving this sense of detachment as opposed to regular patio furniture, perhaps it’s something to do with snuggling up into almost fetal positions whilst swinging virtually weightlessly in a hanging chair that triggers something in the brain, but whatever is going on it sure does relax the body and soul. In this article we would like to show you some of the best hammock chairs available to buy as well as some of the accessories that would best suit your needs such as hammock stands and hammock straps. Hammock Sky have this large Brazilian hammock chair to offer which I think encapsulates all that is good with these products. It is the style of hammock that gives you a great big hug when you get inside it and won’t let go until you climb out. This particular hammock chair is made from 65% cotton which has been treated to make it colorfast. This is a great feature as the colors for either of the two options available are vibrant and not something you would like to lose. The material also lends itself to being child, family and pet-friendly whilst also capable of holding weight up to 300lbs. Hammock Sky also offer a lifetime warranty which means, they say, that if you are unhappy at any time with the hammock, you can send it back for a full refund. 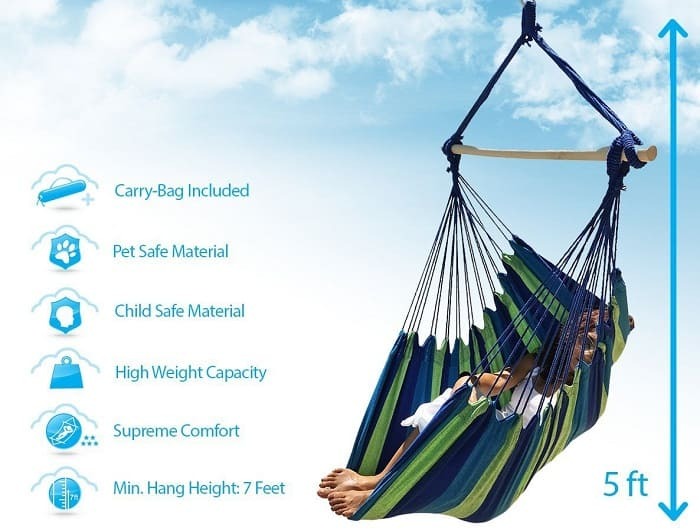 The Sorbus hanging rope hammock chair swing seat is Amazon’s #1 best-seller and although not my personal preference, there are an awful lot of things to like about it. The addition of a back support and two cushions will be a god-send to some people who can sometimes feel too enclosed by hammock chairs. Larger frames can sometimes experience some discomfort with their legs hanging over and the material cutting into their legs, so the cushions can offer protection in those situations. It is also a very portable hammock which can be taken down and placed somewhere else easily should you want to swap between indoor and outdoor lounging. It can support weight up to 265lbs and the material is machine washable. All in all, for under 40 bucks this is a very solid hammock chair which will suit some people very well. The Tranquilo Caribbean hanging rope chair hammock by Tranquilo Outdoors is aesthetically the most simple yet most beautiful hammock chair out of all our suggestions. This plain white chair is made from Teotoron cotton which, going by pretty much every review, makes it extremely comfortable. The overall simplicity of design means it will look just as good as a stand out feature piece or integrated into any room inside or out where the neutral coloring can blend in effortlessly. This for me is not a spread yourself out as much as you can kind of hammock chair, more of a get yourself extremely comfortable, tuck your legs in and enjoy a good read kind of one. When your aim is to get through the next fifteen chapters of that best seller you have been gorging on, then this is the chair you need. This Tranquilo Caribbean chair can take weight up to 260lbs and it is recommended that you do not machine wash.
At this point I’m going to have to hold my hands up and admit to some pretty serious cheating. 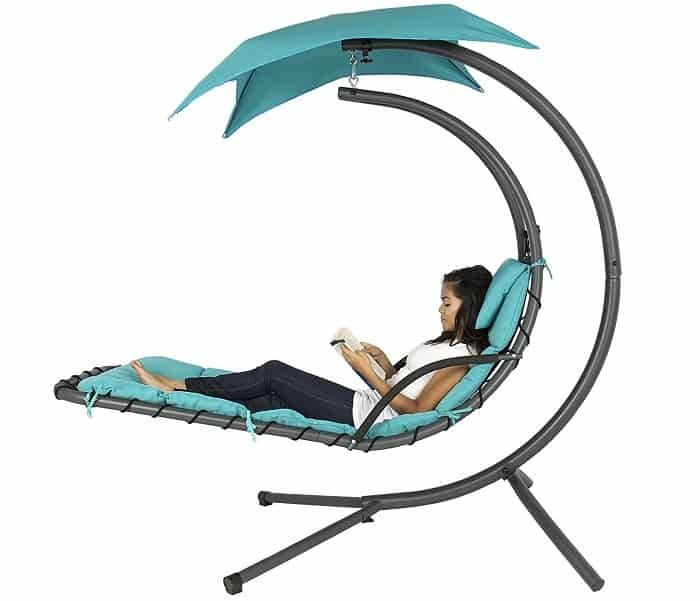 The hanging chaise lounger hammock by Best Choice Products isn’t really a hammock chair despite its name. Despite this though, I think it shares a lot of features that we are striving for when looking for the best hammock chairs. You still get to spread yourself long, relax and nap or read, whilst at the same time experiencing the slight rocking motion that many of us find so comforting. This hanging swing chair comes with its own C frame, 2in thick padded cushioning and a built-in removable canopy. The frame is powder coated to give it all weather properties and the lounging area is long enough for anyone in and around the 6ft 6in area. If you are normally too big for the standard hammock chairs then this is probably the option to go for. The Caribbean hammock chair with footrest by Caribbean Hammocks is a large hammock that stretches out to over 6ft. It is made from 100% spun polyester cords which help it prevent against rot, mold and mildew. The actual chair itself is formed into a mesh type design which can benefit from ventilation on hot days as opposed to the closely woven fabrics of some other hammock chairs which can leave you sweaty. The Caribbean hammock chair comes in a variety of six colors, all of which are very tasteful and will give you the option to match to your surrounding pieces of furniture. It is advertised as coming with a foot rest and although it is not a foot rest like you normally see with a hammock chair where there is a separate piece for you to place your feet, it does come with a tighter woven section where placing them will feel like a natural thing whilst giving you the necessary support. The vast majority of hammock chairs will be available with no extras included. This means that it will be up to you to best determine how you are going to hang your chair to get maximum enjoyment from your purchase. The easiest way to do this is to buy a hammock stand. For Hammock chairs this generally means buying either a C frame or a closed frame. There are a lot of cheap options out there for you to choose from but I would suggest investing a bit more money which in the long run will work out as the cheaper option. Buying a cheap hammock chair frame will invariably lead to an inferior product which may actually be unsafe to use. They can be liable to rust very easily and structurally they will not be as strong as the ones that are a little more expensive. I have a couple of recommendations for C frame hammock chair stands; the Hammaka Arc Stand and the Strong Camel C frame stand are both heavy duty hammock chair stands which will stand up to the elements and reliably hold you and your chair in place. For the closed frame stand I would recommend this by Sunnydaze Décor. It is a heavy duty, powder coated steel frame that is easy to assemble and disassemble. This frame is also height adjustable so you can customize your seating height to your exact requirements. 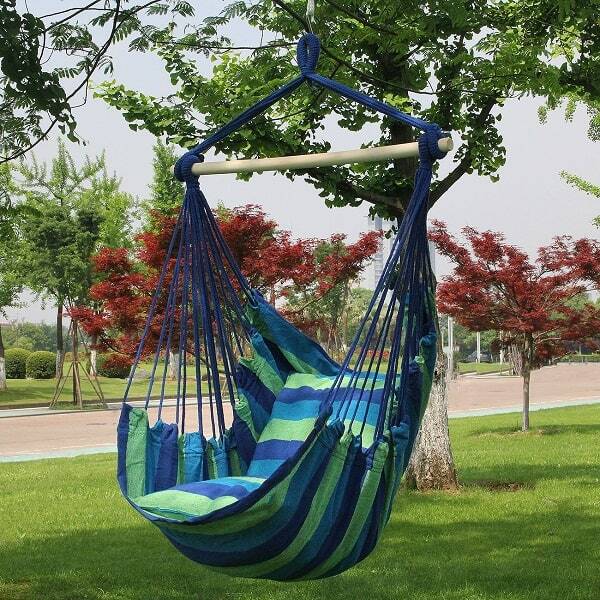 An alternative way to hang your hammock chair is to use straps that fit around a tree branch or a porch beam. This is a super easy option that requires no great skill on your part if assembling equipment is not your thing. There’s absolutely no drilling required or any other tools for that matter, just strap onto a healthy, strong branch or beam and attach the carabiner to the pivot hook on your chair. Something like this from SuperBEARPower will do the job more than adequately although there are many other options available. Although they hold weight up to 1000lbs you might just want to go for extra strength by investing in some heavy duty carabiner like these from Rallt. Hammock chairs are a great way to relax. For people with injured backs like me, they are a great pain reliever. I have a hammock chair that is too old (straps are weak and all) and now I am looking to upgrade. The hammacka hammock is really nice, I’ll certainly consider it while buying.